Raising awareness, changing attitudes and removing barriers for people with disabilities in the built environment. The Rick Hansen Foundation was established as a Canadian charity in 1988 and has since been dedicated to Rick’s life-long goal of creating an inclusive world where people with disabilities are living to their full potential. For three decades, the Foundation has raised awareness, changed attitudes, and removed barriers for people with disabilities, as well as fund spinal cord injury research and care. While we’ve made great strides towards creating an accessible and inclusive world, there’s still more work to be done. The Rick Hansen Foundation Accessibility Certification™ (RHFAC) program works to help improve accessibility of the built environment – the places where we live, work, and play – in Canada through a rating system to determine the accessibility of commercial, institutional, and multi-family residential buildings. Once rated a building may receive one of two certification levels, ‘RHF Accessibility Certified’ or ‘RHF Accessibility Certified Gold,’ and will have the option to be listed on the RHFAC Registry hosted by the CSA Group. 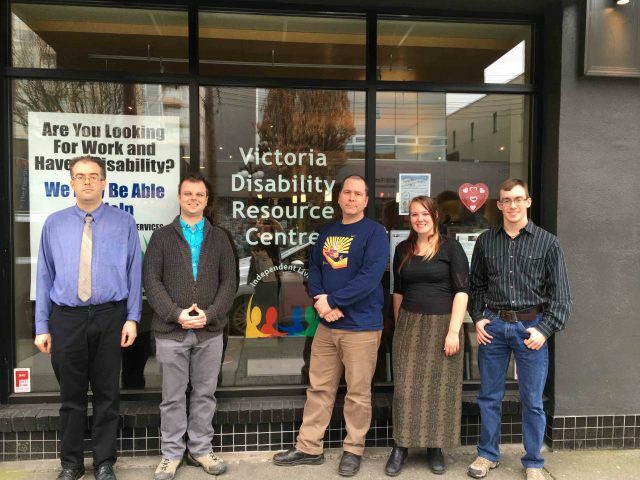 The Victoria Disability Resource Centre is home to a team of six local RHFAC Accessibility Assessors and their Manager who will be conducting complimentary accessibility assessments (all fees covered by the BC Provincial Government) throughout British Columbia until March 31, 2019.